The Palestinian Authority's move against the BDS activists shows that it considers the movement a threat to Palestinian interests. "No, we do not support the boycott of Israel." — Mahmoud Abbas, President, Palestinian Authority. At university campuses in the US, Canada, Australia and Europe, they are hailed as heroes campaigning for Palestinian rights. But in Ramallah, ironically, activists belonging to the anti-Israel Boycott, Divestment and Sanctions [BDS] movement are seen by the Palestinian Authority [PA] as trouble-makers and law-breakers. "[PA] Minister of Health, Hani Abdeen visited the Israeli Hadassah Hospital yesterday [May 5, 2013]. This is the first visit by a Palestinian minister to one of the most important Israeli hospitals, according to the hospital's announcement. BDS proponents often present their case in terms of peace, human rights and justice; however, this masks the real agenda of seeking to destroy Israel rather than simply improve the lives of Palestinians and help them achieve independence. The true aims of BDS become clearer when the views of the movement’s leaders are examined. As the examples below demonstrate, they oppose a two-state solution or any other resolution to the conflict that would recognize the right of the Jewish people to self-determination in their homeland. The ICC’s former chief prosecutor says the Palestinians wouldn’t have much of a case against Israel. In the dysfunctional state of Israeli-Palestinian relations, the “nuclear option” for the Palestinians would be joining the International Criminal Court as a member state and exercising that membership to launch war crimes investigations against Israel. At least, that’s the view of many in Israel, which, like the United States, is not a member of the ICC. But to judge by comments made by the ICC’s former chief prosecutor, Luis Moreno-Ocampo — who, even two years after leaving his post in The Hague, remains the controversial court’s most persuasive advocate — Israel has little to worry about. But he isn’t at all sure that if the Palestinian Authority were to join the ICC — or if Israel were to join, for that matter — the international court would actually play an active role in the conflict. The Palestinian Authority did go to the United Nations, and its status has since been upgraded to non-member observer state, making it eligible to join the court. All the same, Moreno-Ocampo said ICC membership could be a double-edged sword for the Palestinians, since it would also open them up to investigation for alleged war crimes, such as rocket fire and bombings targeting Israeli civilians. Moreno-Ocampo’s warnings may seem strange to those who see the ICC as an interventionist organization of busybodies, but he doesn’t see the international court as an institution that should necessarily be conducting many global investigations. The former chief prosecutor is certain the ICC’s impact will be felt over decades, not necessarily because of the cases that actually go through the court but because it is drawing a line between war crimes that can only be prosecuted by an international forum and cases that will be increasingly dealt with by the countries where the war crimes took place. A survey conducted by Professor Sammy Smooha of Haifa University shows that the acceptance of Israel by Israeli Arabs increased markedly between 2012 and 2013.
a) the percentage of Israeli Arabs who accepted Israel’s right to exist as a Jewish and democratic state rose to 52.8% from 47.4% the year before. b) there was a more pronounced rise in the percentage of Israeli Arabs who believe that Israel can exist as a Jewish majority state to 43.1% up from 29.6% a year earlier. c) the number of Israeli-Arabs who accept their identity as such without identifying as Palestinians increased from 32.5% in 2012 to 42.5% in 2013.
d) in 2013, 63.5% of Israeli Arabs consider Israel to be a good place to live up from 58.5% in 2012. "THE STATE OF ISRAEL AND THE DRUZE COMMUNITY: IMPLICATIONS FOR MINORITY INCLUSION IN THE MIDDLE EAST"
Following is a review of the context of the Druze community in Israel. A copy of the whole report can sent on request. religious affairs and matters of personal status,” including marriage and divorce.31 The Druze community is a relatively small segment of the overall population. 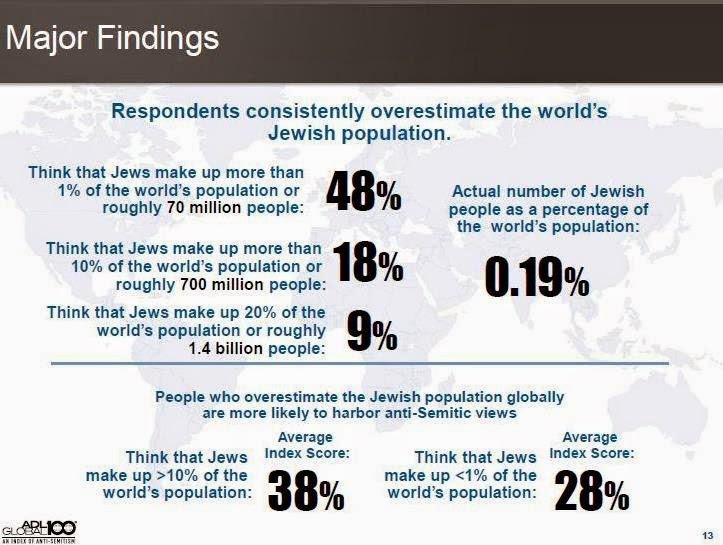 The population of Israel is approximately 7,821,850, of which 75.1 percent are Jewish, 17.4 percent are Muslim, 3.9 percent are defined as other, 2 percent are Christian, and 1.6 percent are Druze.32 Israel is, nonetheless, a Jewish state, and Israel’s “vehicles of state” demonstrate intentional policies towards furthering what the government considers to be Jewish interests. A brief summary of Druze history is essential to understand the origins of the Druze community’s religious and quasi-ethnic identity as a minority group in the MENA region. The Druze religion developed from the Ismaili movement of Islam in the 9th and 10th centuries C.E., from the Fatimid Caliphate in Egypt. The Druze religion then spread in Egypt between the years 1017 and 1048. As it developed, however, the Druze religion was faced with much opposition, often violent, from Sunni and Shi’ite Muslims.35 Today, the Druze are not just a minority in Israel, but also a minority in every country in which they reside (Lebanon, Syria, and Jordan). They are also a religious minority branched off of the Ismaili Shi’ite minority sect of Islam, with a strong sense of history and local territorial connection. As the Druze religion spread throughout the region, it also developed into a quasi-ethnicity. Israeli Druze view the religious designation of “Druze” as also being connected to an ethnicity, hence the term quasi-ethnic. By 1976, an education system was established for Druze villages where the majority of teachers were Druze.46 The goal of this type of education was to create an Israeli Druze identity among the students. These historical events set the stage for the relationship between the state of Israel and the Druze community. 25 While there are competing arguments concerning the nature of the state of Israel, it is outside the purview of this research to debate this specific political issue. The continuing Israeli-Palestinian conflict makes any characterization of the type of state that Israel is to be a politically charged characterization. While we recognize that there are various claims and arguments supported against the notion that Israel is a democratic and non-discriminatory state, we also do not intend to debate this issue within our research. The most neutral and unbiased sources, such as the CIA World Factbook, were used to try to get an accurate picture of the type of state Israel is. With regard to discriminatory practice, this is in fact one of the main parts of our research as it relates to the Druze. Discrimination towards other non-Druze minorities was not included in our primary research objective, although certain examples of it did arise in our interviews. 26 “Library.” Central Intelligence Agency World Factbook. https://www.cia.gov/library/publications/the-worldfactbook/fields/2128.html. 27 Saffon, M. P., and N. Urbinati. "Procedural Democracy, the Bulwark of Equal Liberty." Political Theory 41.3 (2013): 441-81. 28 “Basic Laws of the State of Israel.” Israel Ministry of Foreign Affairs. 29 “The 1948 Declaration of Establishment of State of Israel.” Israel Ministry of Foreign Affairs. conscience, language, education and culture; it will safeguard the Holy Places of all religions; and it will be faithful to the principles of the Charter of the United Nations” (Israel Ministry of Foreign Affairs). 31 “People: Religious Freedom.” Israel Ministry of Foreign Affairs. 34 Gabriel Ben-Dor. “Inclusion of the Druze in Israel.” Personal interview. 10 Mar. 2014. 35 Halabi, p. 2. and Shawki, Taxi driver. 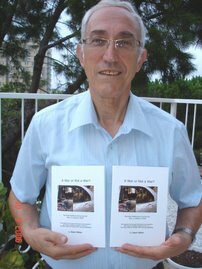 “Historical roots of the Druze in Israel.” Personal interview 8 Mar. 2014. 37 Ibid. and Halabi, p. 2. 39 Although the Druze speak Arabic, we discovered ambivalence from our interlocutors regarding their self-identification as ethnically “Arab.” Several of our informants stated that since they spoke Arabic they are Arab, but then also distanced themselves from the “Arabs.” They view themselves as different, not just religiously, but also ethnically, from Arabs. 43 Firro, 2001, p. 42. 44 Firro, 1999, p. 190. 45 Majid Al-Haj. Education, Empowerment, and Control: The Case of the Arabs in Israel. New York: State University of New York Press, 1995, p. 73. 46 Firro, 2001, p. 50. 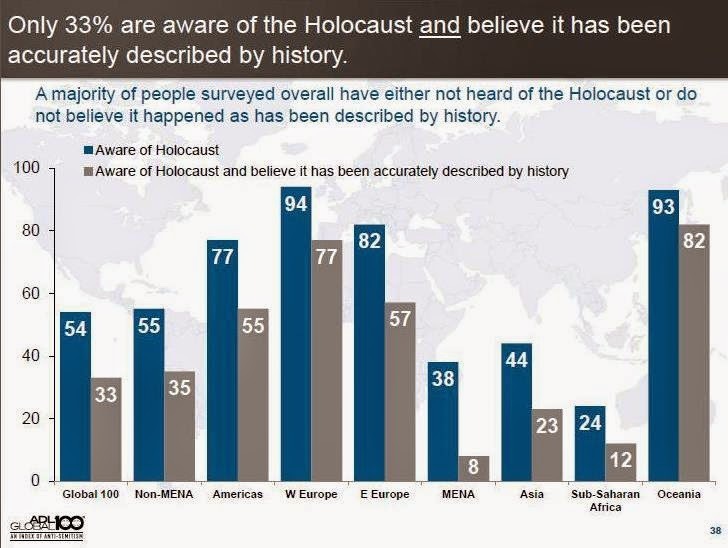 The Anti-Defamation League commissioned First International Resources to research attitudes and opinions toward Jews in more than 100 countries around the world. All interviews were conducted between July 2013 and February 2014. The data is a result of 53,100 total interviews among citizens aged 18 and over, across 101 countries and the Palestinian Territories in the West Bank & Gaza. Expected margin of sampling error for the weighted global average is +/- 0.97%,. All respondents were selected at random. Telephone respondents were selected using random-digit dial sampling; face-to-face respondents were selected using geographically stratified, randomly-selected sampling points in each country and at the household level. 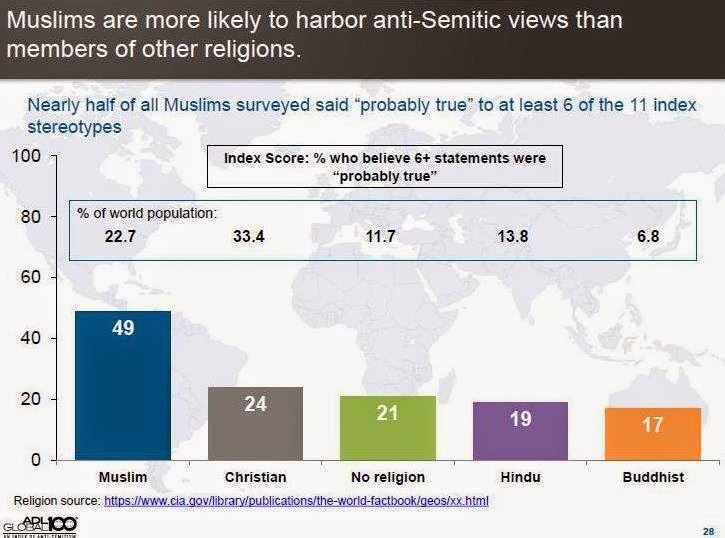 Scores were created by asking whether the following negative stereotypes are “probably true” or “probably false.” Respondents who said at least 6 out of 11 statements are “probably true” are considered to harbor anti-Semitic attitudes. It should not surprise me that visitors to Israel are surprised by certain daily events that occur here. Whilst the media gives excessive coverage to any incident where an Israeli commits an illegal act against the Arab community (an act which under no circumstances can be condoned), the day to day actions of Arabs against Jews are barely reported, so it is no wonder overseas visitors come with preconceived ideas of what life is like. U.S. Congressman Dr. Andrew Harris on Wednesday said he was “surprised” by the limited access for non-Muslims to Jerusalem’s Temple Mount and the “discrimination against Jews” he witnessed during his visit, along with Congressman Ron DeSantis. “It surprises me as an American, believing in religious freedom, that [such conditions]would exist,” Harris said. “Both were clearly moved by the experience and expressed concern at the lack of religious freedom for Jews and Christians at the site,” the Temple Institute said. Harris and DeSantis, Republicans from Maryland and Florida, respectively, are in Israel as part of a week long visit organized by the Yes Israel Committee in conjunction with the YESHA Council, which represents the Israeli residents of Judea and Samaria. The sirens will wail today and the nation will come to a halt. It’s a collective tribute to those heroes who have fallen so that we Israelis may live in freedom. Yet as Michael Dickson writes , http://tinyurl.com/pmvz5aj “This year, as Israelis pay tribute to their servicemen and women, a very different event will be taking place on Independence Day in London. Yachad – the British version of lobby group J-Street – together with the New Israel Fund, will be hosting “Breaking the Silence”, a notorious anti-IDF group. No one serious would suggest that Israel is beyond criticism but this is strange yet deliberate timing. If past experience is anything to go by, the audience will be treated to a flurry of half-truths and accusations (never proven) aimed solely at blackening the name of Israeli soldiers. Indeed, “Breaking the Silence” has made its name by promoting a distorted and unfair portrayal of the IDF via its website and tours. a) the context of terrorism, the goals of Israel’s enemies, the deadly rockets fired from Gaza. b) how the enemy hides behind Palestinian civilians and attacks Israeli civilians. Conversely, tucked away in the inner pages of the Jerusalem Post this morning was a report of a Palestinian who was illegally attempting to scale the barrier in order to get into Israel to seek work and fell several metres breaking his leg. He was bleeding profusely when Israeli border policeman St Sgt Maj Hassan Amid (an Israeli? Yes an Israeli!) rendered first aid to save his life before the Red Crescent ambulance arrived to take him to hospital. “In cases like this” said Amid “we don’t think twice, we provide the best possible first aid assistance we can”. This is the true face of Israel.